Teri La Pass Trek is a unique but very special wilderness trek route of Nepalese Himalayas offers magnificent Himalayan vistas, unique cultures, tradition, and typical lifestyles. TeriLa pass 18,296 ft recognized as an adventurous trek throughout the Annapurna region. Trek into Nar phu combine with the upper Mustang, you need to have a special permit issued by a department of immigration of Nepal. Furthermore Terila pass hiking, you can see the medieval Tibetan culture in undisturbed form, dramatic mountains view and great alpine scenery. Teri la pass is an outstanding & tough trek gives an adventurous enjoy as well as typical local cultures and lifestyles. As you are on the top of Teri la pass, you will have a magnificent view of Annapurna family, Gangapurna, Tilicho peak. As soon as you cross over Teri la pass, you could continue your trip to Lo Manthang villages. This trek is recently updated by Nepal government and possible to do as an alpine style Tent trek in Nepal. This trek is designed for world travelers who wish to trek through beautiful hidden fortified hamlets Naar phu and Upper Mustang passing over Teri la 5595 meters with relaxing manner than take a look this itinerary however if you are planning with limited time wise and if this itinerary is not suits you then request us for customizing itinerary. Upon arrival in Kathmandu, Tribhuwan International Airport, we will receive you with private vehicle and transfer to hotel in Kathmandu within BB plan. Our representative will give you information about further programs. Day 2 Kathmandu World Heritage sites (1,348m / 4,422 ft) tour, 6 hours. All aspects of gear and conditions are discussed to make sure you’re fully prepared for the trip, and any last minute questions answered. After lunch, we explore this medieval capital. We visit Boudhanath, also known as Little Tibet. Then we visit Pashupatinath, holy temple of Hindu where cremation takes place by the holy river Bagmati. Later we visit Kathmandu Durbar Square and Syambhunath Stupa. And transfer to hotel. Early morning from Gongabhu Bus station of Kathmandu city, express drive to Besisahsar / Bhulbhule through Prithvi High way. From Besisahar or Bhulbhule take a local jeep to Syange the drive is with the view of River, greenery local villages and beautiful mountain scenery, from Syange trekking to Jagat overnight in a guesthouse, if the drive is late we can stay in Syange waterfall also. Day 4 Trek to Dharapani village (1,960 m/6,409 ft), 6 hours. After breakfast start the working through the jungle after we left Chamje from chamje the trail goes bank of Marshyangdi river mostly climbing before arriving in Tal. Then trail continues through barley, rice, potato fields and pine forests past the village of Kodo taking us to Dharapani, which is one of the big villages in the Manang valley. Overnight in Dharapani village. Day 5Trek to Koto village (2,670 m / 8,731 ft), 5 hours. The trail goes through in and fir forest and then follows the river for a time among the higher oak and maple trees. On the way you will have an excellent views of some snow covered mountains. Overnight in Koto. We walk through a steep and constrictive path through the dense forest, after crossing the river the trek leads to Nar phu valley with passing the beautiful pine forest with wide waterfall before arrive the Dharmasala, we will get to see several small shelters (caves and a pilgrims “Dharmasala”. Overnight stay at Dharmasala. Day 7Trek to Kayang (3,560m / 11,641 ft), 6 hours. The trail climb up the valley along the small river before arriving Meta (3,700m), a non permanent winter settlement of Nar, the trail passes through white rocks, low shrubs, junipers, scattered evergreen. We can have best Mountain View on the way, after passing the Junam we will arrive Chako formally a Khampa settlement. Overnight at Kayang. Day 8 Trek to Phu village (4,200m / 13,734 ft), 5 hours. Walk down hill along the river bank and past the submarine rock with small campsites, than we have best view of chortens with the canyon lands and gorges takes us to the Phu gate from where we can see the three village of Phu where we stay overnight. Day 9 Rest at Phu village for Acclimatization and for explore Phu valley. Again walking up and then coming back down is better than just resting in high altitude, we can walk up to alley to the summer grazing settlement at Ngoru, can spend the time interact with local people visit Gompa. Stay overnight at phu village. Day 10 Phu village Trekking to Nar (4,150m / 13,570 ft), 5 hours. Today we will trekking back to Phu gate Khyang, Chyarkha and Jhunam to reach to Nar. During your journey, we’ll get to see some beautiful gorges and some breathtaking scenery also. We will pass wonderfully painted, bamboo topped Chortens and arrive Nar gates on the top of the hill. Stay overnight at Nar village. Day 11Explore day at Naar and surroundings s area. Visit Monasteries and village. Todays, we follow Lapse Khola then cross the river and continue walk up to Chubse kharka (4,400m Lunch Place) and walk straight for an hour then walk down to the river side at our camp. We walk continue up to Labse khola t passing a number of side valleys. We set up our camp near the River. Ascending to the High camp following the Labse Khola valley. Camp at high camp. 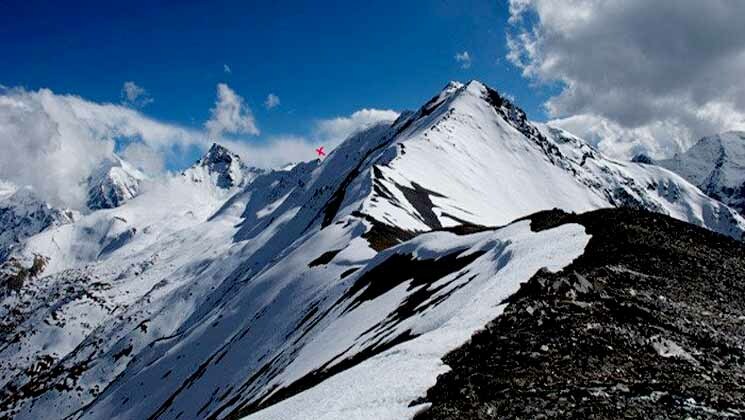 get the summit of Teri la pass which is the highest elevation of whole trek. We start our hike early morning, summit the Teri La at 5,595m /18,296 ft from where you can superb views the Annapurna & Chulu mountains & Teri La Peak, Purtun Himal region. As soon as finishing taking photographs we than descend down hill walk to Pasphu Khola where we fix our camp to stay overnight. Walking several ups and downs with tiny narrow trails, crumbing ways continue descending downhill to Yakpa Khola river where 2 river meets. We fix our cam tonight to stay here. Several high ridges later we descend into the Tangge village, Tangge is a village of twenty houses, many sheep, goats and large mastiffs and the largest chorten in Mustang, over fifty feet high. There was a massive mudslide some years ago which wiped out many of the houses and barley fields on both banks; an elder of the village told us there were over a hundred houses in Tangge before this disaster. We fix our campsite tonight to stay overnight. Leaving Tangge heading northeast we cross the plateau on a little-used trail, following it through more fantastic landscapes, and eventually the green village of Yara below, across the Puyung Khola. Descend to the rocky river bottom than we cross the river and head for the village. We camp for the night in the courtyard of a local guest-house in the lower section of Yara, a bustling campsite full of Mustangi life. Have a walk above the village in the afternoon, sun shining through the willow leaves which brighten the village. Heading to the capital of Mustang, we trek through a magical world of salt drips, narrow canyons, pebbly flood plains and soaring cliffs. The right fork heads to the 14th-15th century Chos Sung Gompa,. The nomads to the north hold the key to the main gompa. We have reached the fabled walled city of Lo, with a single entrance through which only the King, Queen and Kempo (Abbot) are allowed to ride. All others must walk, to pay their respects to Chenrizig, the Buddha of Compassion. King Jigme Palbar Bista, called ‘Lo Gyelbu’ by the Mustangis, still resides at his four-storied palace inside the city walls. He is an avid horseman and keeps his own stable of horses, some of the best in Mustang. These days, the king plays a somewhat ceremonial role although he is well loved and respected throughout Mustang. Another day in Lo – Manthang gives you the chance to explore its many sights; the Tall Champa Lakhang (God house,) the red Thugchen Gompa, Chyodi Gompa and the Raja’s Palace; as well as to gaze at the surrounding panoramic views of the Tibetan Plateau and the Himalaya. Besides Lo-Manthang there are two other interesting valleys worth visiting. The western valley Tingkhar, the sight of Raja’s summer palace, Kimling and Phuwa as well as the Gompa of Namgyal (The Monastery of Victory) is the newest and most active Gompa in Lo. In the eastern valley lies the village of Chosar, also rich in gompas and the valley is the main trading route to Lhasa. Day 21Descend from Lo-Manthang to Dhakmar (3,520m / 11,510 ft), 9 hours via Ghar Gompa. This is an opportunity to visit two other villages on your return trek. The trail climbs steadily to the pass marked by a cairn, offering a last glimpse of Lo-Manthang. We cross the highest pass this trek and arrive in Ghar Gompa (3,920 Meters). This monastery is very old and older than Samye monastery in Tibet, supposed to be built around 730AD. After crossing the pass around 4,100 meter than we descend down to the way in Dhakmar (3,520m) where we fix our camp site for stay overnight. From Dhakmar the way goes down to until Ghami 11,314 ft the huge greenery village in Mustang where we can see the ancient monastery and stupas with. You can see the local houses here like cave. Than after the trail goes ascend until Nyi La pass and descend to Samar through the same route. We fix our camp for stay overnight here. Today, we trek descend downhill to Chhusang. The trail offers panoramic red stone cliffs. After Chhusang we will climb little more than arrive in Tangbe village and finally we will be in Kagbeni. We trek to Jomsom with the valley of Kaligandaki River which is also known as windy valley where every day big wind blowing and overnight in Jomsom. You will explore in Jomsom village. Early morning we fly to Pokhara with thrilling spectacular Mountain View including Dhaulagiri, Nilgiri, Annapurna south, Annapurna I and Machhapuchre during the flight. Transfer to the hotel to check in for a hot shower and relax. Then we drive back through the scenic countryside and during the route will stop for breakfast & lunch. It takes 6 hours back to Kathmandu. On arrival at Kathmandu, a guide will transfer to the hotel and rest of the day relax or explore the surrounding areas and overnight at hotel. How much is the Teri la pass trek cost? This trek is available now on USD 2890 is standard trek price on double occupancy basis. In this price, we offer you Tourist Standard accommodation located near Thamel, Kathmandu and tourist standard accommodation in Pokhara Fewa lakeside and of course the trip price will vary according to group size. Taking flights from Jomsom to Pokhara and to Kathmandu saves your time and riding bus reduces the trip expenses. For the deluxe and luxury trekking tour plan, we add Jomsom – Pokhara – Kathmandu airfare, 2-star boutique category hotel deluxe air-conditioned room in Kathmandu (BB PLAN) and 2-star hotel standard accommodation in Pokhara (BB plan) with attached bathroom while on trekking on possible places, so let us know. AND WE ARE OPEN TO CUSTOMIZE YOUR TOUR AND PACKAGES PRICE AS PER YOUR REQUIREMENTS. International tour leaders are highly encouraged to get discount and attractive complimentary. Upper Mustang special permits cost USD 500 for each guest for each 10 days. Fully escorted trek with fluent English speaking license holder local guide, professional cook and each guest = 1 Porter basis. Alpine style camping & guest house accommodation along the routes. Guided tour in Kathmandu city world heritage sites transfer by private vehicle. Insurance of guide, cook and porters. Lunch and Dinner during the staying in Kathmandu and Pokhara city. We can organize private Teri La Pass Trek starting at any date that works for you. Please contact us for more information. Question: Do I need experience to do Teri la pass trek? Answer: Basic experience is better. Moreover, it is suitable for keen trekkers/walkers who are able to walk around 4 or 5 hours in a day, with a lightweight daypack. For this trekking, if you have about the little experience would be better. Question: What kind of accommodation can I expect on Teri la pass? Question: What kind of food can I expect in Teri la pass trek? The dinner and breakfast are provided in the same lodge you spend the night every day and Lunch will be provided on the way to the next place where you are going. Our cook cooks delicious vegetarian meals if there are no lodges. Question: What opportunities will I have for a shower along express Teri la pass trek? Answer: Tea house trekking all the lodges they have a shower which you can get it somewhere paying and somewhere without paying however if you are in camping trekking – we provide you hot water bucket then you will take a bucket shower. Question: How do I get drinking water on teri la pass Trekking? Answer: During the trekking route there are all places hotel and shops where you can able to buy mineral water and you can buy it for drinking but however we advise against buying mineral water in plastic bottles, as currently there are no provisions for disposing of these. Instead, we provide you boiled water or bringing chlorine tablets to purify the normal water as the normal water is available in campsite/along the way. Answer: During the lodge trek there will be more chances to charge the battery. We recommend you bring an extra pair for in case. Remember to bring your adapters! An extra battery will be recommended. Question: Is there any communication facilities on teri la pass trekking? Answer: In this trekking route you can get telephone services as well as internet services as well. Answer: No! So, for the trekking routes, you need to have cash Nepali rupees because credit cards work only in the bigger city areas. And regarding the deposit, we prefer 20% advance deposit of the total price of the trip in order to confirm your reservation before you arrive in Nepal. And the rest of the payment can be made after your arrival in Nepal. Question: Who will carry my luggage on Teri la pass trek? Answer: We provide porters to transfer your luggage. As we are a responsible trekking tour operator agency, each of our porter carry maximum 25 kilo of your backpack which means 2 guests (12.5 kg luggage of each guest): 1 porter basis. Narphu valley offers picturesque villages, turbulent river gorges with nice waterfalls. Kang la 5315m valley offers awesome view of whole Annapurna Himalayan ranges. Exotic hidden villages “Nar and Phu”, Many ancient monasteries and chortens. Exotic hidden treasures “Upper Mustang – The forbidden kingdom”, Many ancient monasteries, chortens & caves. The above trek subject to change due to a condition beyond our control. This is a Guideline showing tentative camp night stops. Physical, technical and natural condition may change this above itineraries. Opportunities for challenging trek or hiking and pleasant strolls are scattered all over this planet; you just need to know where to find them. We at Gokyo Treks and Expedition believe in the quality services. Your safety and satisfaction is our concern. We are a team of professional, experienced, well trained and licensed local guides who know the destination much better than others. Professional precious help and super friendly! Great trek, run by competent people, a special guide called SOM Shrestha and Kamal Khatri and a nice carrier. Fantastic landscapes and unforgettable encounters. Gokyo Treks is the right agency to make a trek in Nepal!!! Thanks at all!. – Cristiano Lissoni, Milano, Italy.